Is this gorgeous female congo peacock displaying for a group of males? “The male Congo Peacock is monogamous, though more information from the wild is needed.” The monogamy of males is information gathered from observations made in zoos. It is repeated in most Afropavo congensis sources. 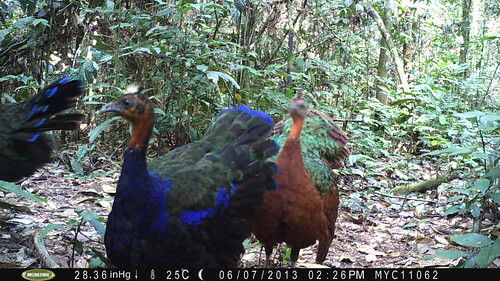 Our camera trap clips leave us wondering, however, if perhaps the females aren’t polyandrous? Here a handsome male joins her in a full display, but another male is to the far left. 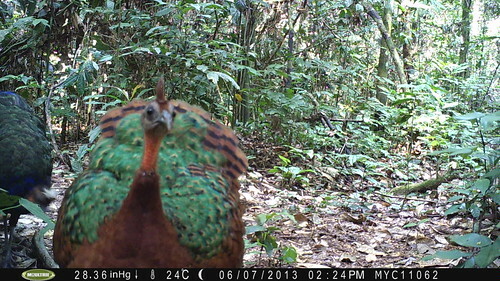 Camera traps have given us our first small window into peacock behaviour in the congo forest. Previously our information came from hunters and dead birds. Here the two males are just beginning to lower their tail feathers after displaying together with the female. Wherever our camera traps recorded female Congo Peacocks, the female is with more than one adult male. There were two series of frames, one of stills and one of video clips. Although our photo stills (above) did not show obvious aggression between the males, we thought perhaps the video would. The video comes from much farther south. Whereas the photos were snapped on our Losekola study area in upland forest in Orientale Province; the videos were taken on our KK/4 study area, about 150 km SSE, in Maniema Province, on the other side of the Lomami River. The scene above shows a female (far right) and at least two males moving through the understory in domestic calm. Other photos and videos show only a single male. In the video above a solitary male peacock seems to be in “combat” with the camera trap. We hear peacocks more often than we see them. A visitor, Trip Jennings, made the recording below outside the southern part of the park, on the left bank of the Lomami River. Thanks, Trip. This entry was written by Terese Hart, posted on 2013-10-22 at 9:38 pm, filed under About the project, Natural History of TL2. Bookmark the permalink. Follow any comments here with the RSS feed for this post. Post a comment or leave a trackback: Trackback URL. Fabulous! This is absolutely thrilling. HUGE congratulations. This is FABULOUS!!!! Thrilling expose and so exciting to see these secrets revealed. HUGE congratulations to your team. Fantastic photos! Photos of these as wild birds are MUCH better than those that have been caught by villagers. Splendid, magnificent birds! Can you post their call? Now I’m the jealous one! Beautiful shots, guys! Hi Amy, thank you for your generous comment. I think your photo of the hen Afropavo with the chick, that you took with your hand held camera in Lomako while watching bonobos remains the all time most remarkable picture of species. I looked for that on flickr but did not see that….Did I miss the link on this slow internet connection ? Great to hear from you, and hoping to see you again in Congo. OMG what fabulous pictures, and what fascinating behaviour to follow up on!! Is that a Lek? My efforts lie in the dust/mud behind those of Amy and that little camera – congratulations and can’t wait to see where this discovery takes us. totally mind blowing images. have to see this bird soonest. Tremendous images and video. Would love to see these! Fascinating social set-up too. Suddenly reminded of trumpeters which I have studied in Amazonia – not so dimorphic, but same kind of size and ecology and definitely polyandrous (dominant females have small harem of males). What incredible photos – thank you for sharing those with us! And some nice issues to ponder. There was a time during the captive breeding programme, where when had enough males available, we would try to offer the female two males to chose from as we had the impression that that resulted in a better chance for reproductive success. Maybe you really are on to something here. Let’s hope more time will tell (more). I wish you all the best. OMG!! Congratulations, these pictures and videos are incredible! 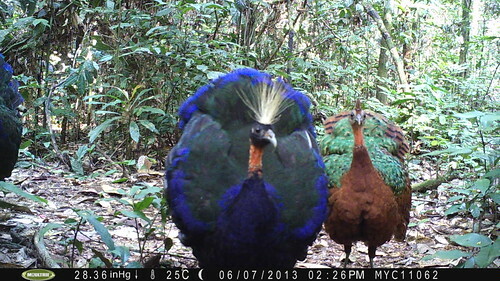 It’s fantastic to watch these images of peacocks social behaviour in the wild. You must have been so exciting when you realised what the camera traps had caught! These birds are truly magnificent. Well done – your work is so inspiring. Thank you for sharing it with us. Maybe the second male is a younger one, probably their son. His face looks a bit more like that of the female and has a smaller crest. These videos are fascinating from an ethological perspective. I’ve noticed that galliform birds react upon detecting cameras. Peafowls including argus invariably approach the strange creature and threaten it with their plumage. You may recall that my research at WCS was comparative psychology. I am interested in the evolutionary biology of the galliformes. I suspect that what we perceive as ornamental plumage is foremost protective. These photos and video substantiate this concept. Facultative social polyandry is apparently a common reproductive strategy with some species. The Highland guan, grey peacock-pheasants, Malayan peacock-pheasants ,, roul roul and blood pheasants appear to be serial monogamist, Congo peafowl males tolerate one another but females generally do not. This is also true of argus and peacock-pheasants. I suspect this has to do with defense of the home range of a social unit. Male progeny are encouraged to remain within the home territory by the adult male but the young females are displaced by their mothers. In the photos of the female with two males, there appears to be a juvenile male and its parents threatening the camera. The flock of Afropavo is absolutely fascinating. I am searching for photographs and video of the black guineafowl and the plumed guineafowl if you are ever to come across some that you could share for publication in the Encyclopedia Gallomorphae I would be most appreciative. o.s. please say hello to Rachel for me.